If the Modi government has its way, Tesla might soon be rolling out its slick cars on Indian shores. It has extended an invitation to Tesla to set up its manufacturing hub for South and South East Asia in India. The annoucement was made by Nitin Gadkari, minister of road transport and highways, who visited the company’s San Francisco factory on Friday. The government wants to allocate land to the carmaker near major Indian ports to facilitate exports, an official statement said. The minister also offered to promote joint ventures between Tesla and Indian automobile companies to introduce pollution-free road transport in India. Gadkari not only showed interest in electric cars but also battery-powered commercial and public vehicles. He said Indian government was committed to encourage pollution-free transport by providing incentives to bio-fuel, CNG, ethanol and electric vehicles. 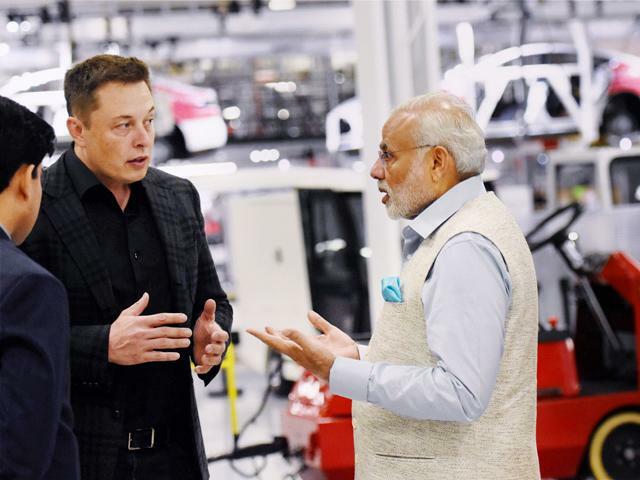 Last year, Narendra Modi had visited Tesla’s factory in Fremont California as a part of US tour which had seen him meet top US business leaders. He had met Elon Musk who had personally given him a tour of the state-of-the-art facility. “Given high local demand, a Gigafactory in India would probably make sense in the long term,” Musk had told reporters after Modi’s visit. Tesla’s Gigafactories are huge installations that churn out batteries that its cars use – the first factory in Nevada is among the biggest factories anywhere in the world. In 2013, India introduced a National Electric Mobility Mission Plan (NEMMP) to have six million electric vehicles, including two-wheelers, by 2020. Government aims to provide fiscal and monetary incentives to popularise the nascent technology. If this plan becomes a reality, India could save 9,500 million litres of crude oil equivalent to Rs 62,000 crore savings.